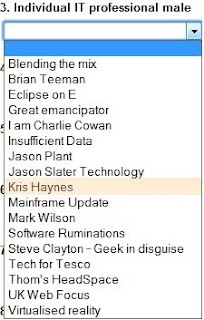 I’ve been nominated for the Computer Weekly IT Blog Awards 2010! It's a great feeling to have been nominated for the Computer Weekly IT Blog Awards 2010 in the Male IT Professional Blogger category, sponsored by IBM. The voting structure is very simple, number of votes cast, with one vote cast per visitor. 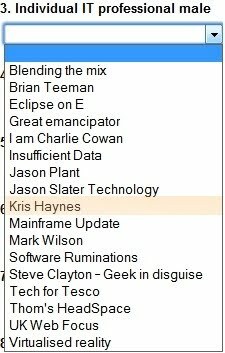 So if you’re a reader of this blog, and want to vote for me, visit the Computer Weekly Voting Page for the Male IT Professional 2010 category, hit the big Vote Now button, and pick my name from the list for the Male IT Professional drop-down. I’m really grateful to those people who took the time and effort to nominate me, and for anyone else who votes for me – I really appreciate it :). Don't forget to vote for some of the other fantastic nominee's in the other categories as you only get one chance to vote. Congratulation for being nominated. I wish you more success. Congratulations. The contestants in CMV are all good in IT. I wish you good luck.